Product Deatails - Material- Cotton with Lycra , Color-Grey , Suitable - Large and Xtra Large Breeds Dogs. Product Information -Trixie Dog Socks Non-SlipThe practical dog socks made of cotton and spandex provide your pet with the anti slip sole grip on smooth Fleche. 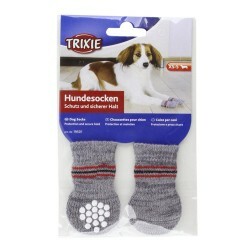 They are also particularly well suited for older dogs and very recommended for Rockne- and joint pain. The healing of injuries can be supported. At the same floors and furniture are protected from scratches. Protect smaller wounds.